The Bad Suns are back and grittier and more harmonic than ever. The Cali rockers debut album Mystic Truth hit the shelves March 22 and is the most complex Bad Suns project to date. “One Magic Moment” - the single off this LP came out a few weeks earlier and had the same sing-songy undertone that had been the Bad Suns signature sound since they first garnered attention for their cuts such as “Cardiac Arrest” and then later with poetic anthems such “Heartbreaker” and “Swimming in the Moonlight”. But this song had something different, more of a guitar base and a harder feel. But somehow the Suns made even a mildly more alternative single feel light as a feather. Harmonies grace the choruses and the folky slap-clap rhythm pulsates through the song. This can be seen as a motif throughout the album – starting off fittingly with “Away We Go” which sends out early 2000s alternative vibes, and “A Miracle, A Mile Away” which even gave the group a U2 feel. Songs like “Hold Your Fire” and “Starjumper” come off as ballads which are somewhat of a rarity for the group. So give Mystic Truth a listen – it’s the Bad Suns serenading your ears like never before. If you’re looking for a band that blends old alternative influences into something fresh, I highly recommend checking out this little British band called Bad Sounds. They released their debut album, “Get Better,” last year, and one of my favorite songs on it is “Avalanche.” The bass and guitar riffs permeating the entire song are reminiscent (but not derivative) of early 2000’s bands such as The Strokes and Interpol. On top of that, peppered in are these lovely synthesizer layers that immediately make me think of New Wave bands from the 80s (Depeche Mode and New Order in particular). Even if you’ve never heard of these bands before and have no idea what I’m talking about, “Avalanche” will hook you in no matter what, so give it a listen. “Like Nothing” is the kind of song you listen to when you’re trying your best not to stress yourself out. “I was coming back from coming undone,” sings lead singer and multi-instrumentalist Micheal Lerner over a wandering, 60s-influenced guitar riff. The chorus feels cathartic and soothing without losing any of its rock edge. Sit back, listen to this gem, and feel a little less stressed. 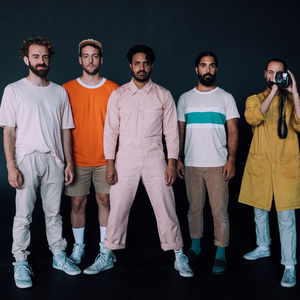 WWSU Heads to Indiana – Young the Giant! Three months ago, I had never heard of Young the Giant. It wasn’t until a friend of mine introduced me to the Los Angeles alternative group on Spotify that I really fell in love with their music. I clicked through tracks such as “My Body” and “Amerika” and I was hooked. Fortunately, at the time that I was delving into their discography, they were on tour. Unfortunately for me, the closest stop was a three-hour drive from where I was. So, last Thursday afternoon I made the hike up to Purdue University to see the L.A. rockers. The venue was large, but not extremely conducive for the type of jump up and dance band that Young the Giant had proven that they were. The show opened with a cut off their most recent album Mirror Master then followed by an enthusiastic rendition of “Something to Believe In”. Song after song, lead singer Sameer Gadhia enthusiastically belted the lyrics to tracks like “Titus Was Born” and “Apartment” while a rocking tempo pulsated through the auditorium. The band itself was great, I have no complaints there. The only thing that I would have changed about my experience was what I mentioned earlier – the venue. The tight, classically-built theater chairs didn’t enable any movement that has proved essential for so many concerts of this genre. The crowd simply wasn’t into it and wasn’t able to be. It wasn’t until the latter half of the performance that the band played their most popular hit “Cough Syrup” and the throng of college students all joined in on the chorus – one of the only times in the show most of the crowd was involved. All in all, I thoroughly enjoyed the set – a solid 9/10 music-wise, proving once again that it is always better to see your favorite bands live in concert, there simply isn’t anything like it. And to Young the Giant, I’ll see you in June with Fitz and the Tantrums and COIN! When Sam Smith came out with his first solo song since his second album (a quietly uplifting ballad for the Watership Down Soundtrack), I didn’t think much of it. Artists do songs for soundtracks all the time; it doesn’t mean they necessarily have anything else in the works. I woke up this morning to “Dancing With A Stranger,” a smooth, rhythmic R&B-inflected Pop song that compels you dance away any thoughts of your past relationships. “Look what you made me do/I’m with somebody new,” Smith duets with Normani (formerly of Fifth Harmony). The song is a change of pace from the soul of his first two albums, moving Smith into a more Pop-oriented territory. I haven’t heard heartbreak sound this refreshing in a while, and I’m excited for what he’ll do next. Have you heard? R&B boy group, B2K reunites in 2019 with the hottest tour of the year! Omarion, Lil’ Fizz, Raz B and J-Boog are grouping up and performing some of their hottest hits like “Bump, Bump, Bump” and “Girlfriend”. This will be their first time performing with each other in over a decade! 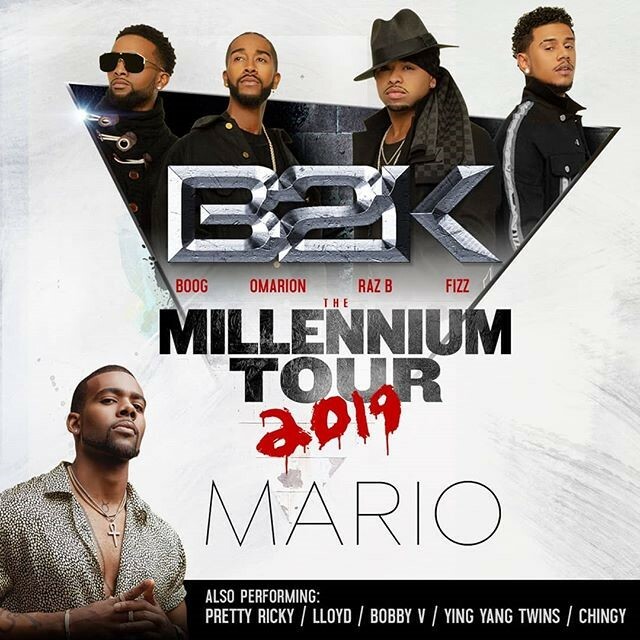 The tour will also include other R&B and Hip-Hop sensations of the early 2000s: Mario, Lloyd, Pretty Ricky, Bobby V, Chingy, and the Ying Yang twins. Everybody who lived in this era should be in attendance or you’ll be missing out on a night that will go down in music history! Tickets are available for purchase now on Ticketmaster. Tour dates and locations are posted below. 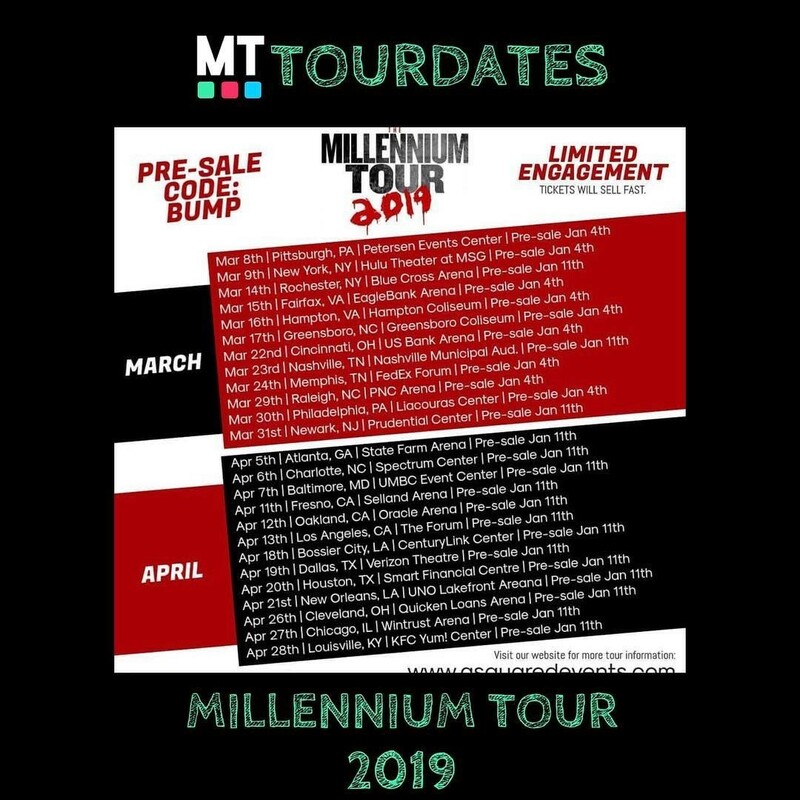 The Millennium Tour is expected to sell out so grab your favorite throwback jersey and purchase your tickets before it’s too late! This will be a night that goes down in music history— will you be in attendance? WWSU 1069 is covering Rock on the Range! WWSU is on it's way to the MAPFRE Stadium for the infamous Rock On the Range festival. WWSU will be sending you updates live from columbus and will be interviewing some of your favorite bands. Make sure you follow us on facebook, twitter, and instagram to be updated around the clock. If you are headed to Rock on the Range check out this schedule to see where and when your favorite bands are performing. Adios 2018 Spring Semester and winter finally. Spring semester is finally coming to a close. Did it seem fast? I feel like I never really got my footing and I've been falling down a flight of steps ever since. Anyway, I hope everyone has a great finals week and for those of you who have somehow gotten out of taking their finals this week, we hate you and you are monsters, that is all. The video for this song is fantastically done, but really sad if you pay attention to the story. I think it does a great job with comunicating the feeling that the song is trying to give. This is a song that when I first heard it, it was like I couldn't listen to it loud enough...good thing I'm already slightly deaf...There is an instance of the f-word in this songs, so if that is too much for your fragile psyche, find a clean version or move on. This song is kind of hard to catogorize. It's electronic but also pretty poppy with a smidgin of 90's style. The video is also fun to watch. Okay, I know it sounds like an inuendo, BUT it is not... I think. I dunno watch video, it's creepy and funny and Primus is always great. I must be in an electropop mood this week. This is another instance where electronica and pop can blend together into something beautiful and hypnotic. This is a beautiful song with a beautifully well done video. It's like the same 15 seconds over and over again but slightly different every time it repeats. As I am sure you are all aware, tomorrow is St. Patrick's day, a day that everybody uses as an excuse to drink Irish booze and wear green. I like to celebrate by making some of the more traditional Irish cuisine like my famous lamb's head stew with plenty of root vegetables. Delicious, as long as you don't mind spitting out the teeth as they tend to fall out during the cooking process. I may be making it again tomorrow if I can find me a decent lamb head from Jungle Jim's, either way I will be eating a potato and drinking whiskey like I do pretty much every Saturday like a proper Irishman! Whatever your poison, be safe out there and don't be stupid...well not too stupid anyway. Here are some songs to get you ready. Working at a theater makes you hate the music in the after credits of a movie because you have to hear it like a million times. This was in the credits for the second Guy Ritchie Sherlock Holmes film and I went out of my to get to clean the theater so I could listen to this. This is one of those Irish songs I'm sure you've heard a million times. Fun fact, the Irish Rovers also sing a song about why there aren't any more unicorns. I refuse to post that song though so you'll have to dig it up yourselves. Scene from "The Other Guys"
Something my family has always said. It's a prayer but it's a good sentiment all the same. I don't know about you but I think Spring Break could have been long. I don't want to be greedy but I was thinking only like three more weeks, that's it...maybe five. Anyway we're back and we gotta get back in the swing of things. Here are some new videos to maybe help make it seem not so bad. Okay, I will have to give you guys a warning on this one. Yes there is a little bit of colorful language in this song, yes it can sound sort of aggressive and yes there is a worm cat vomiting a bunch of cats....Happy Nightmares mwhaha. I think if you haven't noticed by now, I love electro-swing. This is one of those kinds of songs though that I honestly hated at first. But then that beat got stuck in my head and I fell in love with it. if you like this one, check out some of the other AronChupa stuff. This has a great dub step beat while incorporating sounds of video games past. Listening to this gives a great sense of nostalgia, walking into an arcade and hearing all of the machines going at once...I'm not old YOUR OLD! "They Might Be Giants" is one of those classic bands that continues to but out consistently great albums and influence many modern day artists. Of course this song is further aided by the inclusion of Nick Overman and... something else going on. Whatever it is, it's kinda terrifying and awesome. Okay, Tom Waits is one of my favorite musicians of all time. You may recognize him from his acting roles in the past but he has been making music his way for a long time. Everything from Jazz to Rock to ....whatever you'd call his other stuff, he has been playing what he wants. He is another one of those artists that you don't know you know until you start delving more into his discography. His influence in music as an art form cannot be understated. Thank goodness for Spring Break. It is always timed perfectly for when I am just beginning to give up hope. I hope everyone is doing something fun for their break. Not going to Daytona Beach or Miami or whatever you crazy kids do these days *shakes cane at angrily*. No I'm talking about real fun like sleep and....sleep. I really just want to sleep! Anyway, here are some more songs to either put you to sleep or get you in a party mood, I'm not judging *judges silently*. This is the original project for Faith No More's lead singer Mike Patton. He has one of the widest vocal ranges in existence at 6 octaves. For some perspective, an 88 key piano has 7 octaves. He was also the voice of the Darkness in the video games of the same name...NO YOU LOVE MIKE PATTON!!! I an an electrical and computer engineering major here at Wright State. I am also obsessed with music in a mad scientist sort of way. Wintergatan tends to make a great deal of their instruments, and they keep getting better and better. I've built a couple of basic amplifiers and speakers and such here and there but this is a whole new level. I'M NOT JEALOUS YOU'RE JEALOUS! Electro-swing has been around as a genre for quite awhile now. Caravan Palace I feel has been one of the first bands to truly fine tune and perfect the genre. This song is a great example with a beautifully well done animated video. As you all know, this is Valentines day week. Just a reminder to everyone, if you haven't gotten your significant other anything, at this point you are probably screwed. Here are some songs to distract them while you make your escape. For those of you familiar with Dillion Francis, you can expect a great song with a video that quickly turns into an acid trip. Love these guys. Go check em out on Spotify and listen for them on WWSU 106.9 FM. We're getting nice and comfortable into the semester now. I'm starting to realize that the classes I'm taking are going to be nuts this semester. So, in the spirit of trying to get away from reality I present to you a sampling of videos that took reality, introduced itself, and then promptly turned into fire breathing squirrel that kidnapps children to work on a nut farm. If you like: Electronic with the backing vocals of a turkey. Such a great song set to...a love story?...a murder story? If you like: Heavy beat with a hauting piano up front. Ah yes. This happens to me every time I have to cat sit for someone. Thats why I always have an ax. If you like: Crazy electronic with dubstep beats. I'm sure there is a deep meaning to this video, but I'm too busy vomiting rainbows to figure it out. If you like: Melencholy electronica. I know everyone is super excited to start back to school in the new year! Hopefully the holiday season was enjoyable or at least bearable. I started a new tradition of watching the movie "Krampus" for Christmas. 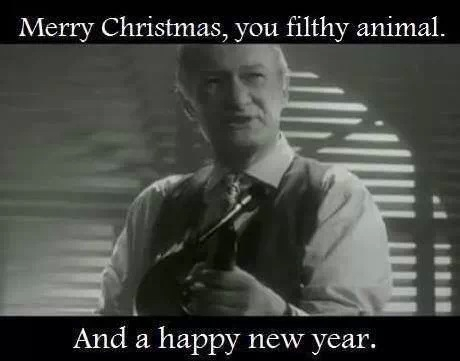 I can't wait until next year when my nieces are old enough to watch it! They'll be the most knowledgable children in their pre-school. If you like: Catching broadway style musicals, ballet, serial killers? Seth Augustus sounds like he has been drinking bourbon daily since birth and I love it. Does this German metal band really need to be introduced. Fun Fact: The lead singer actually had a cable and light pierced through his cheek just for this video...gross. This video must have taken forever to make. This is probabyl one of the most cheery songs I've posted so far. This guy sounds super old and I think he is only in his mid 40's. This is what I would call New Orleans folk. I hope everyone is enjoying their Christmas break. Here's a few more videos for you to enjoy. Fun fact, this video was written and directed by Edgar Wright. If this looks familiar to a certain recent movie of his ("Cough" Baby Driver "Cough") that's because it was sort of the seed. If you haven't noticed I like weird music videos. Thank goodness this semester is finally over!!! I truly didn't think I would live through finals week. Hopefully, we all made it through okay. For those of you who would like something new to listen to, I hope to update this blog every week with some of the new stuff that has crossed my path. So keep coming back for more! Maybe you'll find that next new great band. The video is awesome, think Cold War era James Bond thriller meets West Side Story. If you haven't heard of this band yet and you love folk or modern bluegrass music you need to look at these guy. The Tibbs is a super under rated band that you've never heard of. Their music has so much soul. This may be the most hipster music video I've ever seen. Love this song, love this band. If you like their music, they are coming out with new album "Expectations" February 9!!! Clipping doesn't get enough recognition. He is a master at blending rap with electronic/industrial music. Just a head's up, this song contains some colorful language. If you like: Rap that is different from the norm. Check back next week for more and have a wonderful break! For those of you metal heads who haven't heard ROCK ON THE RANGE 2018 TICKETS ARE ON SALE NOW!!! May 18th, 19th, 20th at the MAPFRE Stadium in Columbus, Ohio. WWSU covered the Breakaway Festival earlier this year at the same location and hope to return to cover Rock on the Range! Don't miss your chance to experience headliners Tool, Avenged Sevenfold, and Alice in Chains including many many more of your favorite bands to rock out to. They have already sold out of several tiers of tickets so you better get them fast! Hope to see you there! The sports broadcasting team at WWSU is trying something completely new and different. This will be a vlog series that will capture the past week in Wright State sports. This week in our first ever WWSU vlog, Wright State's women's basketball team got off to an impressive 2-1 start, volleyball got a win at home and the men's basketball team is struggling out of the gate. Watch and share the video, follow on social media, and feel free to give us any suggestions on how we can improve the vlog series. The out of conference schedule for Wright State’s men’s basketball team has been released with many exciting matchups coming up for the Raiders. Here’s the schedule listed below with highlights from last season. Keep up to date with the WWSU page for new updates on our future broadcasting schedule. Arcade Fire is a very funky groove album the Canadian, seminal indie-rock band is back with their fifth studio album and it's some of their best work yet - every song is a jam! We have created a Kickback and Chill Playlist with our favorite tracks so you can end your summer right! Wanna relax after a long day of class? Go ahead, check them out below. Love this playlist? Send a song request on wwsu1069.org and hear it over the air! Short Moscato is a hip hop artist who has been described as golden age ethereal and psychedelic boom bap with new school overtones. His flow and sharp lyrics are definitely worth the listen to. Mansa, formerly under the name Moniker Manni Phantom describes “Uncomfortable” as a song about his experience of life in the fast lane and how out of place he feels in it all. This song doesn’t receive nearly as much recognition as it deserves. Steven Zhu is a Chinese American singer who focuses on electronic music. “Faded” tells the story of being helpless and just wanting to go back to the person you call home. In Seaside Haux sings about taking a leap of faith to leave the past behind for a beautiful rebirth. The haunting vocals and subtle instruments create the perfect relaxing vibe. Not only is this a perfect song to kick back to but the vocals softly express the feeling of being ignored and the roller-coaster of frustrations it brings. Once you hear this song definitely give a few of the remixes of “Ocean Eyes” a try, if you’re a fan of Blackbear listen to their recreation of melody. Welcome to the Sports department at WWSU 106.9 FM! Here, you can listen to and read about Wright State games broadcasted by your fellow Raiders. In 2016, the Raiders made a huge impact in multiple sports, which WWSU covered on the radio waves. We covered Men’s soccer making it to the Horizon League Championship finals, Women’s basketball setting a record winning streak that led to an NIT tournament appearance, and Steven Davis participating in the NCAA Slam Dunk Contest. WWSU was there with microphones ready and a dedication to bringing you quality Raider sports coverage. As time goes on and schedules for the sports seasons are released, we will announce our sports broadcast line-up as well as other WWSU involvement with Raider Sports. Be sure to follow us on Facebook and Twitter. And check back with us on the latest when the sports seasons begin.